Using arrow keys select which device will be the FreeNAS boot, for me this was the 16GB internal USB drive so I hovered over it and pressed the space bar to select it followed by enter to accept. 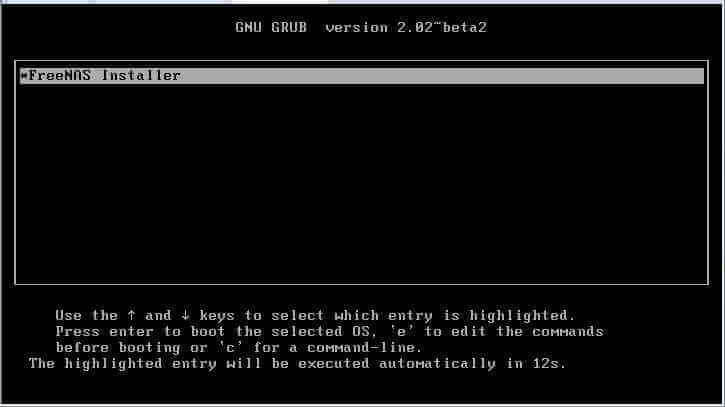 Create a password for root, make this something strong but memorable. Press enter and wait for it to finish the install, this can take a few minutes. Once the install has finished, remove the installation media and reboot, ensure you have a network cable plugged into either LAN1 (bge0) or LAN2 (bge1). FreeNAS should start loading if your boot order is correct. Once booted you should be greeted with a console screen with options, here you should have been assigned with an IP from your DHCP server, otherwise set a static IP. 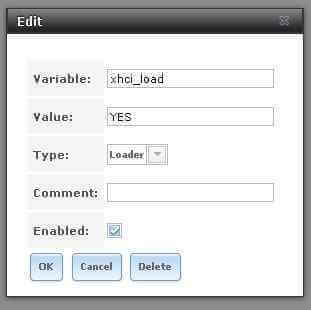 (I created my port channel here using option 2 (LACP), note that I had to reboot for the LACP link to work properly). Enter the IP your FreeNAS server has been assigned on into a web browser on a machine on the same LAN, login using root and your chosen password. Now we’re in and ready to configure. The first thing I did was to dismiss the inital setup wizard, I like doing things myself. Firstly under system>information change the hostname, mine is MUFFSTORE03. Next under General change the timezone to your timezone. Everything else is at your discretion right now, the storage setup will be in the next post. One last thing I did was add a system tunable under System> Tunables to enable USB3 as I will be hanging some USB drives off this box to present to the network. And we’re done! 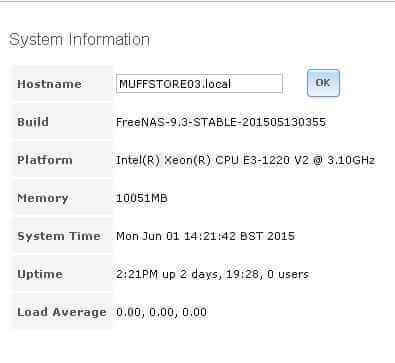 Now FreeNAS is configured and ready to be setup with storage and shares. I will be repeating this with the other box (MUFFSTORE04) also. USB stick is on outside, I have a micro-SD on the inside. Never had this issue on my Gen7 boxes. Have you tried mouting the ISO via iLO? After failing three times I wrote the install file to a disk and used an external CD-ROM… that worked. I have the basic HP Gen 8 with 8Gb of RAM and i would like to install Freenas on it followed by Plex. Am i right in thinking that i can install it on a USB stick and keep the USB stick in the Gen8 so as to have the machine boot Freenas boot from it rather than the single 3Tb drive that I have installed in it? You are indeed correct, just ensure that you install FreeNAS on the stick and give that the highest boot priority. Thanks for your response. I decided I would update the firmware on the HP before going ahead with Freenas. To my surprise, i need to update the warranty with HP. I have tried every which way to contact HPE to do this and being passed from pillar to post and all to no avail; how frustrating!!! Do you have any suggestions as to any other way I can go about this? Is it possible/worthwhile installing FreeNAS onto an SSD? I’ve tried it and it installs but I can’t get it to boot from the SSD whatever I try. Do you leave the raid controller enabled? I have seen some suggestions to disable it in the BIOS in favour of standard SATA AHCI. There is no reason to waste a SATA port on installing FreeNAS to an SSD. Using a decently big USB drive will be better as FreeNAS will only use the boot drive to load the OS into memory and store config. In that case what is the use of the SSD in your setup? (i’ve read in a previous post that you plugged one in your MS…thanks ! do you think it is possible to install the FreeNAS as a virtual machine in ESXi which is installed on the HP Gen8??? It is indeed possible, if you would like to have a guide on this let me know! What RAID levels are available to you under FreeNAS? Does it go beyond those available on the standard HP unit? I’m interested in a tuto about installing FreeNAS 10 as a virtual machine in ESXi on the HP Gen8. Could you make one ? FreeNAS 10 is dead and you should probably move to something else, or an older version. I can put that post on my to-do list if you wish though but I have about 7 other drafts all competing right now! You should read this if you haven’t already. Thank you very much for this information that I didn’t know. 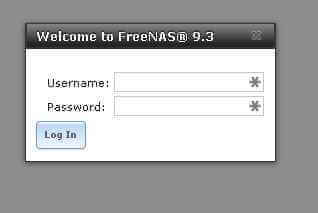 Now, what do you think about a tutorial on installing FreeNAS 9.10.3 on a VM in ESXI ? hi how do you locate a drive inside Gen8 microserver when it fails? You should check the serial of the drive that failed and then power down and check which drive it was. Before installing drives I always document which drives are where for this exact reason.